Every year we bring you a look at Burning Man’s financial performance. This year we’re also going to take a deeper look at their major assets Fly Ranch and Decommodification, LLC. Sales of inventory was $1,605,516. That’s a lot of ice and coffee. Ice cost $596,177. Their stock donation program seems to be working, with a donation of $26,517 in marketable securities. Overall payroll including contractors is $18,703,754 = 42% of revenues. Grants as a % of revenues = 3.8% . Note this includes the cost of building The Man, the base structure, and partial funding of Playa art projects including the Temple. The list of grant recipients contains many familiar names. A huge thank you to A Balanced Perspective, DS and Anonymous Burner for their contributions and thoughts. About 9% of the budget gets piled up in the bank account as cash. What does an organization trying to “make the world a better place” through art need with so much cash, into the tens of millions of dollars? Why do they spend such a tiny amount of the money given to them by Burners every year on art? Why do the ticket revenues increase 10% a year but the art budget seems to keep proportionally shrinking? How can they justify spending $1 million a year on insurance without providing insurance for the 10,000 or so workers on site building the city, art installations and camps? Would it really kill their vision to make $3.5 million a year instead of $3.9 million, and look after their workers better? Why does the main “charitable” organization have to spend more on the Regional Events than they give out on grants? It’s about double the art budget. Is the purpose of Burning Man to spread Burner culture around the world through art, or is it to expand their inefficient bureaucracy? Can’t the Regional events support themselves? The number of paid participants according to calculations in the Pershing County Sheriff’s Office report was 69,493. I filed a FOIA request to get the 2017 vendor list: 84 companies selling things other than ice and coffee. DS has also been filing FOIA requests for information about Burning Man. He was able to get this heavily redacted information for 2017, the calculations used to pay the Bureau of Land Management’s 3% fee. Why the need for such secrecy? One of the interesting things in the 990 is the listing of “related entities”. It includes Decommodification LLC, but the share of end of year assets is $0. Decommodification LLC is the organization that was created at the same time as the non-profit Burning Man Project, to hold all the intellectual property. As far as we can tell, it gets paid $75,000 per year in royalties from the Burning Man Project for use of their trademarks. We have no information on what other royalties it earns, for example from sales of the documentary “Spark” or the “lines around the block” Smithsonian exhibit. Google recently commissioned Burning Man to design a $2 million art installation for their campus: where does this money go? Five lucky artists will get a share, most likely the “big names” who appear in the grants list on a regular basis. Is there a royalty component to deals like this? Decommodification LLC made two filings to the California Secretary of State on January 16, 2019. One was that “nothing has changed”, and another one requested that the company registration be canceled. It seems strange to me to file “no change” and “cancellation” notices on the same date, if anyone has knowledge of how this process works please leave a comment. The current state of the company shows “cancelled” at the S.O.S. web site. According to the US Patent and Trademark Office, the trademarks were transferred from Decommodification LLC back to the Burning Man Project on 28 April 2018 – the day Larry Harvey passed away. The “nunc pro tunc” is a retroactive assignment to correct an earlier ruling. Was this something to do with Larry’s estate? What happened to the rest of the intellectual property, including the rights to future royalty streams? Were the trademarks assigned back to the Burning Man Project for free, Decommodification LLC dissolved, and the accumulated cash of 6-7 years of royalties distributed to the members? Or was some of that $12 million cash hoard used to purchase them? These transactions occurred in 2018, so perhaps will get covered in next year’s IRS Form 990. There is no mention of them on the Burning Man web site, despite this being perhaps the most significant thing BMorg have done since spinning off their non-profit in 2012. BMorg like to claim they’re a “leader in radical transparency”, but Decommodification Inc has always been a mysterious black box. 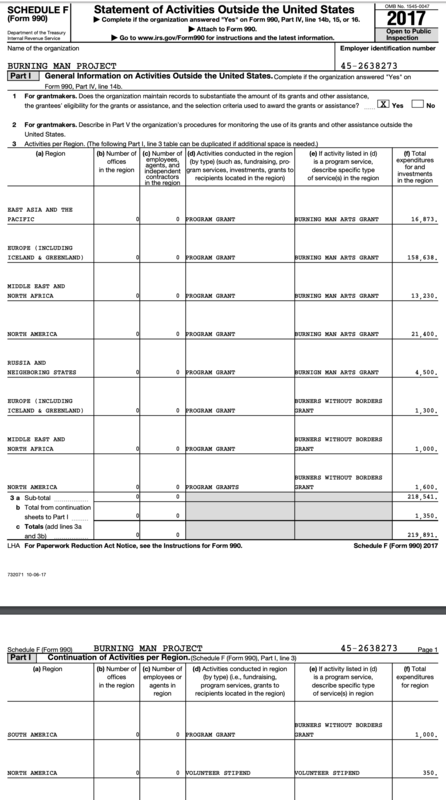 The 2017 Form 990 values the Burning Man Project’s intangible assets at $4.23 million, but this was before the trademark transfer. This amount first appeared on the books in 2014. We believe it represents goodwill on the acquisition of Black Rock City, LLC from the Founders. For a good read related to Intellectual Property and Burning Man, see Culture, Capital and Copycats in a Globalizing Burnerverse by Ian Rowen, which was the keynote address at the 2018 Australia and New Zealand Burner Leadership Summit. In 2016 BMorg bought a 3800 acre parcel of land known as “Fly Ranch” with big donations and paid $6.5 million. This is why the 2016 donations were more than $8 million. Around 42:30 in the above video, they start talking about “community ownership of land”. The communist social justice component of this vision is that “living off the land is a version of Universal Basic Income”. Five minutes into the video, they reveal that the land has been sub-divided into 53 different parcels. Who gets a permanent Burning Man lot? Presumably the 6 5 Founders and the millionaires who put up the $6.5 million. Will the rest be auctioned off to the highest bidder, or handed out to the most favored staff, artists, and camps? I’m tipping Dancetronauts are not on the short list. This reminds me of an earlier post, Get Your Timeshare Slot in the Sultan. There, I postulated that the “ironic timeshare sales” brochures being handed out from a booth at the Man base was actually Burning Man’s way of bringing that in as a future reality. The same thing happened with hotels, where BMorg director Chris Weitz opened an “ironic hotel” at Ashram Galactica, which paved the way for the proliferation of luxury Plug-N-Play hotel camps today. You can see from the plan above that the property is adjacent to another playa. Hualapai Flat is land administered by the Department of the Interior’s Bureau of Land Management. The Bureau of Land Management is planning to dispose of some of its lands. Who else would want empty desert playa? The original vision for the Fly Ranch site was a sustainable community of one acre lots for employees and affiliates, with its own airstrip. This plan talks about 9 parcels of 5 acres, each with their own access roads; and 73 parcels of 1 acre each. The two communities are based on Burning Man’s Ten Principles, and this will be it’s first year-round expression. Employees and affiliates may build on a ‘Homestead’ basis, or rent or buy into the Village community at the project’s north end. For others, one acre lots may be bought for home construction in the project’s central development (and separate H.O.A). These areas will be allowed to grow incrementally, with roads and utilities phased as required. Geo- thermal electricity will serve all the lighting and cooling needs of residents (and possibly the valley’s ranchers as well), and hot water will provide all heating. Organic vegetable farming will be developed as an economic base for the village community. Geo-thermally heated greenhouse organic farming will be operated for local needs, and for transport and sale. This can supply Reno with organic vegetables throughout the year, while creating a wholly independent economy for the community. other contaminants behind to ill effect. The pond waters contain a species of pupfish which are isolated by the underground source and terminal outflow. A nature preserve requires control and enforcement, accordingly this area must be properly fenced to admit access only to indigenous animals, but excluding horses or cattle which trample wetlands. Human access must be highly regulated, with trespass, hunting and public use of existing pools and hot springs banned. Anticipating the utter destruction of too much love, together with the projected costs of controlling and insuring against increasing liability, it is suggested that a Land Conservancy that is affiliated with Burning Man be created to manage the Geyser and wetland area. This will epitomize the style of Fly Ranch, and become a beacon for the greater community. A restaurant, rooms and services will be available. Fly Lodge will be available for public and corporate use, while also serving as World Headquarters for Burning Man’s Regional organizations around the globe. Burning Man Board Member Chip Conley’s experience with luxury boutique hotels and AirBNB would come in handy for a plan like this. How Much For That Oasis In The Desert? Burning Man’s balance sheet shows land, buildings and equipment of $11.9 million; net of depreciation, $9.9 million. Schedule D, Part VI lists the value of land as $7,233,545 and buildings at $979,870. In 2015, before the Fly Ranch purchase, land was $198,000 and buildings $979,780. According to Nevada property records, Fly Ranch only cost about $2.6M. The Washoe sales records record two transactions for $2.377M and $0.240M. The water rights came under two different transactions and appear to not have specific value attached to them. The water rights transactions gave the prior owner only about 64 acre feet of water for livestock. These sold the mineral rights but not the water but referred to other linked sales of water rights. 3) transfer of water rights with a carve out for the prior owner for item 1). 4) transfer of water rights with a carve out for the prior owner for item 2). The main water rights for the hot springs, Cottonwood Creek and Little Cottonwood Creek are the rare and highly coveted “vested water rights”, granted before 1905. My source tells me that the Burning Man event draws 12 million gallons of water per year from this property (27 acre feet). We recently published discussion from the Washoe County Commissioner’s meeting about the possibility of redrawing district boundaries so that Burning Man would be part of Washoe County (which gets the economic benefits from event-related tourism) instead of Pershing County (which gets a massive spike in crime rates with no economic benefits). Fly Ranch is next to Hualapai Flat. Burning Man was held at this location once, in 1997. Hualapai Flat is where Pershing, Washoe, and Humboldt Counties meet. Fly Geyser is in Washoe County. Is the proposed Washoe Boundary move related to long-standing plans to purchase Hualapai Flat? Is BMorg sitting on $4 million from the Fly Ranch donations to acquire this land? The plot thickens, with this post saying that Burning Man was under contract to purchase Fly Ranch in 2009, and real estate developer Build SF helped organize their corporate restructuring to provide “personal financial security” for the 6 Burning Man founders. In 2009, the BUILD partners were introduced to Larry Harvey and his partners at the Burning Man Organization. Burning Man was in contract to acquire a 4,000-acre ranch in the Nevada desert on which they planned to move the annual Burning Man event as well as develop a desert art center. BUILD facilitated a transaction that allowed Burning Man to adjust its corporate structure, manage tax requirements, protect trademarks, establish a permanent office, and provide personal financial security for the six Burning Man partners. Real estate provided an elegant solution for these complex, multi-dimensional challenges, while preserving and honoring the basic precepts of Burning Man. We are proud of the part we played as advisors to Burning Man in establishing a clear path and solid foundation for everyone’s long-term benefit, including the event itself. I have another trusted source who drew the “intellectual property in a separate company” structure on a napkin for CEO Maid Marian. I will ask their opinion on this. It’s interesting to see the difference between Part III 4c & Schedule F Part 1. I don’t quite understand how they split the difference between those two sections. What I can provide you with is that we gave 4 grants through our Civic Ignition Process coming out at 4,900$ and 21 grants through our Annual Community Micro-Grant Program coming out at 18,800$. Between the two programs that totaled $23,700. There was also a series of Fiscal Sponsor funds that were raised and given out. One of those being the $30,363 for the Camp Epic Santa Rosa Fire Relief (which is in one of your screenshots above)— but I don’t have the ability to pull up all those numbers at this time. I’m also realizing while going through my data that it isn’t the easiest to find some of this stuff unless you know where to look. So taking a note on improving our reporting systems for the future– I appreciate the opportunity to look at how we can do better at reporting in a more transparent and better to find way. It has been three weeks after this post showing the remaining five founders of the Burning Man Project, and Larrys estate, sold the valuable Buring Man ™ trademarks from their Decommodification LLC to the Burning Man Project, but there have been no statements from them in regards to the cash, and other compensation, they gained in due of the sale of their privately owned trademarks. Might any person desire to disagree, after they ‘donated’ the BRC LLC, dba Burning Man and producing the Burning Man Event, to the Project at the end of 2013, after taking all net cash from the BRC LLC gained over the history of Burning Man towards their pockets, they made a movie, Spark: A Burning Man Story, bragging about their selflessness in regards of doing so. But, after selling their privately owned Burning Man ™ trademarks to their Project within 2018, there is silence upon these matters. The 2018 Afterburn report did not discuss this sale. Or, might we have missed the movie? In addendum of the cash, from the Project ledger, that the Project bylaws state of any person is of the ability to walk into 660 Alabama Street, within normal business hours, purposed to view, and copy, the Project Board minutes, of which, it includes any payments of higher than $500,000, what other compensation might they have gained in due of this sale? A reporter, in addendum of gaining the Project Board minutes, might query them as to were any payments, perchance from Ticketfly, sent to an escrow account, or directly to their Decommodification LLC, for this sale that would not be on the ledger of the Project, might they be of the ability to utilize the Burning Man ™ trademarks in other manners, perchance, in the manner of a movie, or might compensation for the sale of the trademarks be utilized as a ‘buy in’ towards the upcoming Flysalen joint ventures? The remaining five founders of the Burning Man Project, and Larrys estate, took many hidden millions of dollars towards their pockets within their two, or, perchance three, cashouts while desiring of Burners to donate their art, labour, cash, and entertainment towards the ticket buyers and begging the Borg for tickets in the Worlds Biggest Guest List. Within 2014 I penned a guest post, thank you, burnersxxx, estimating their cashouts. My belief is of it was Larry whom penned a comment upon the post. Oh, that’s why they are called “numb”-ers. Lol. When you think about it, why does anything cost what it costs and what is money.. or gold, for that matter? I have always felt that the ticket prices were a balance, keeping the income greater than the expenses without taking on corporate sponsors. This allows the event to continue as opposed to go belly up. As I recall in ’97, the event ended up $200,000 in debt. I appreciate that they do the work and take on the burden of responsibility to keep this game ahead of the game. So far, I’m more inclined to be greatful for their contributions rather than prematurely fear their corruption. Whenever I encounter any of the LLC members, I see them engaged in positive actions and not wallowing in gross excess. Larry promised transparency in regards of their finances, and the money they take, would be ‘a suite of well lighted rooms‘. He lied, and the five remaining founders have not disclosed their compensation for the sale of their Burning Man ™ trademarks. Hey there. Curious where you got the number of Burners Without Borders only giving away 4.900$ in grants. That’s an erroneous number. (Which I know because I gave away the grants myself). Would love to know where you sourced that from……would love to correct that for the future. There’s a couple of ways you can slice the numbers from BWB which can include our annual grant programs (Community micro-grant, Civic Ignition) but also sometimes includes our Disaster Relief grants and Fiscal Sponsorships. Anyways. Would love to know how I can make sure that the number are correct going forward. Kudos for your efforts and the efforts of Burners Without Borders. The $4,900 is in due of the 2017 990 form schedule F Statement of Activities Outside the United States states BWB Program Grants of $1,300 towards Europe, $1,000 towards Middle East and North Africa, $1,600 towards North America, and $1,000 towards South America. That is what the BMP credits BWB within the form. The 2017 990 form part III line 4c Civic Engagement includes the Regional Network and Burners Without Borders. The Civic Engagement Grants of $88,214 are credited to the BMP, thus it is difficult to understand the grants by the Regional Network, and the grants by Burners Without Borders. Within the grants by the BMP is 2017 schedule I part III, Grants and Other Assistance to Domestic Individuals, including $5,169 towards fiscal sponsorships, $17,415 towards community based projects, and $25,300 towards global art grants. Might you download the 2017 990 form and describe the grants from Burners Without Borders within the $88,214 of Civic Engagement grants so proper credit might be given? Kudos. Many non profits match donations similar to the donations BWB raised for Camp Epic Santa Rosa Fire Relief. It would be awesome might the BMOrg do so for BWB in the future. I regards of matching donations, might Burners imagine the art at Burning Man, in the place of the BMOrg donating solely $800,000 of partial grants towards the artists, of the BMOrg donating two million dollars of grants towards the artists, and matching the next million dollars of donations towards the artists? The BMOrg queried Burners for a Cultural Survey of a Residential Black Rock City in the autumn, a cultural metamorphosis of the manner of the BMOrg matching donations might be most desired. Schedule F, Part 1 of the 2017 IRS Form 990. If you’d like to provide us the correct information for 2017 that would be great, I’ll add it to the post. Kudos for an awesome, very organized, and very restrained, post, burnersxxx. For an event, and an organization, built upon everyone giving, including of the artists, volunteers, donors, theme camps, and numerous others, my belief is of the hiding of their conflicts of interests by the remaining five founders of the Burning Man Project, in due of the payments they gained for their Burning Man ™ trademarks, and their other conflicts of interests, is most disrespectful towards the Burner community. The remaining five founders of the Burning Man Project are most welcome to disclose the payments, of whatever manner, they gained for assigning the Burning Man ™ trademarks from their Decommodification LLC, to the Burning Man Project. My belief is of they will, in due of this post, disclose their payments directly from the Burning Man Project in due of any person is of the ability to walk into 660 Alabama Street, within normal business hours, purposed to view, and copy, the Burning Man Project Board Minutes, of which, it includes of any payments of higher than $500,000, and report upon these matters. Kudos, again, for your work for the Burner community, burnersxxx, and kudos to the others whom assisted upon these matters. My belief is of the nine per cent Nevada Live Entertainment Tax of near to $3,600,000 is not included within the $4,349,723 in Permits, Taxes, and Fees. The Nevada Live Entertainment Tax was started upon tickets for the Burning Man event within 2016, and the Permits, Taxes, and Fees was $3,805,304 within 2015, and it was solely $3,280,650 within 2016. My belief is this tax is sent from TicketFly, directly to Nevada, and it was not included within the $42,816,766 of 2017 Burning Man event revenue, or within the within the event costs. In due of this, my belief is the Burning Man event revenue is near to $46,400,000 might the Nevada Live Entertainment Tax be included within the Burning Man event revenue. In addendum, in a most similar manner, my belief is other revenue is not included within the $42,826,766 of Burning Man event revenue. Kudos to the person whom supplied the blacked BLM page showing 76,580 tickets were sold for $41,825,941. It was commented this included of the tickets, and the vehicle passes, while other revenue, in the manner of ice, and coffee sales, and other revenue, was within another page of which, it was all blacked. The sales of inventory was $1,605,516, and the 2017 BLM permit states other event revenue, in the manner of BMOrg levies upon the Outside Services vendors, and the Plug and Play camps, must be included within the maths for the BLM three per cent playa use levy. The difficulty is $41,825,941 of tickets, and $1,605,516 of sales of inventory, and other event revenue, is higher than the $42,816,766 of Burning Man event revenue reported upon the 2017 990 form. What might be the rationale of this, and where might the missing revenue have gone if it was never upon the BMOrg ledger? I am in agreement with the comment in regards of the BMOrg is as clear as coconut oil. I spent a lot of time trying to reconcile the different versions of ticket revenue reported. In the end I took that stuff out of the post because it was very confusing. It’s hard to understand why the information was redacted, given that this is a charity event on public land. I think the Live Entertainment Tax is applied to gross ticket sales, but not the $12 per item handling fee or the vehicle passes. The BLM 3% comes off everything, including the gross revenues with the Live Entertainment Tax. If they don’t get a cut of the $12 handling fee you get pretty close to the reported event revenue. Without the entertainment tax, I can’t get the revenue number up to $42 million based on 69,000 tickets sold. It’s about $4 million short. Your point about the permit costs being high before the tax was brought in is a valid one. Maybe there are two BLM fees, one the 3% cut and one based on fixed costs. If that’s the case, then they must be making a TON of money from selling things other than ice and coffee. Clear as coconut oil, for sure. I share the Pershing County Sheriff’s suspicion that the ticket numbers being reported may not be entirely accurate, and there may be more tickets and vehicle passes being sold than are stated. Very hard to prove something like that, though. Kudos for an awesome post, burnersxxx. I am in agreement, it is clear as coconut oil. There are two BLM fees, the 3% playa use fee, and the BLM cost recovery fee. The 3% fee is, at the least, $1,254,778, and a chart of the BLM cost recovery fee is within the Washoe Shoedown post, which states of the 2017 BLM cost recovery fee is $2,341,705. This is a payment of $3,596,483 towards the BLM. I trust the 76,580 tickets sold number penned within the blacked BLM 3% Commercial Use Fee report. Your 2017 Tickets has an awesome chart on the 75,000 tickets the BMOrg desired to sell, when the 2500 second wave of DGS is included. And, they are making a ton of money selling ice, coffee, and, perchance, diesel and propane on the playa. The 2017 990 form states Gross sales of inventory of $1,605,516, Less cost of goods sold of $985,634, for a Net income from sales of inventory of $619,882. Thanks ABP. Even the maximum scenario in that 2017 tickets post didn’t bring in enough revenue, although in re-reading that post I see from the comments that I left out 2500 tickets in the second tranche of Directed Group Sale. This suggests I was right about the crafty comma placement, there were 5000 $1000 tickets and 5500+ VIP $1300 ones. We’re still not up to $42.8 million, though. The net profit from the inventory sales seems to be on the books as other revenue of $619k, rather than the gross amount being considered part of the $42.8m event revenue. This seems strange to me, but I trust with the massive amount of money spent on their lawyers and accountants that the document is prepared correctly. So if the tax isn’t included in the revenue calc, they sold another couple of million dollars worth of tickets even above my 72,500 ticket scenario. Airport landing fees? Burner Bus and Burner Airline tickets?